After losing her entire family, the last thing that Clara Bixby has left in her life is her less-than-fulfilling job at the bar that used to belong to her father. Unfortunately, the bar isn’t doing well, and the new owner cannot afford to keep Clara on. During her last shift, Clara hears news of a town called Destination, Nebraska, populated almost entirely by bachelors. With so little else going for her, Clara has an idea: what if she helped to match up the myriad of single women left in New York after the Civil War with the bachelors of Destination? 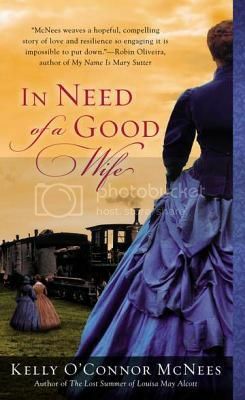 In Need of a Good Wife focuses primarily on Clara, two of her brides, and Destination’s mayor. Elsa is an immigrant who has worked as a laundress for years and all but given up on the idea of marriage and thus resigns herself to going to Destination as an older man’s live-in housekeeper, hoping simply to find companionship and a happier life than the one she knows in New York. Rowena, however, has much bigger ambitions. A former society woman, Rowena finds herself virtually impoverished after the loss of her husband in the war and her father’s ensuing senility and is determined to find a husband that will help her support her father without letting all of New York society know of her dire straits. With In Need of a Good Wife, McNees has brought to life a portion of American history that is not often studied: both the post-Civil War settling of the West and mail order brides of the same time. My complete and utter inability to put In Need of a Good Wife down did not come solely or even primarily from the novel setting, however. No, the real magic of McNees’s book is its ability to transport the reader. You are firmly placed in the late 19th century, first in New York, then on the train west, then in Destination, Nebraska. This is partly due to McNees’s abillity to set the scene in a quick but unobtrusive way, and partly due to her characters who leap off of the page. Each of the main characters in In Need of a Good Wife is a real, flawed person. Some act more sympathetically than others, but all of them act in ways that are understandable and completely in line with their personalities. The fact that they are immediately identifiable as real, living people helps draw the reading in from page one, and McNees’s strong writing and fascinating plot line makes In Need of a Good Wife a book that is hard to put down, but easy to pick back up. I wasn’t initially sure if this would be a book for me, but now I’m convinced! Post-Civil War settings really appeal to me, and the plot sounds intriguing. I loved this book too! I thought the premise was so unique, and I was pleasantly surprised by how funny it is. I loved Lost Summer of LMA…I will definitely add this to my TBR list!!! Sounds great. I just saw that Kirsten Potter narrates it, and since I really like her performances, I may check it out in audio. I love good historical fiction, especially the kind that you can really sink into and believe. This sounds like something I have to read! Thanks for the review! This sounds like my kind of book. I love when characters leap off the page and we are seamlessly transported to another era. Thanks for the recommendation. This sounds really good–I love the time period as well. Will have to keep an eye out for it.